Palm Springs is a beautiful and upscale area with tranquilizing mountain views and a vibrant downtown for hotels, shopping and restaurants. Palm Canyon Mobile Club - not 55+ but if you are looking for something more stylized and urban appearing, you may like these "tiny homes." Blending in with existing mobiles in the park and on Indian land with monthly lot lease. 1880 S. Palm Canyon Dr.
Ramon Mobile Home Park - A few blocks from the downtown area. Older mobiles and park models new and resale. Full hookup RV sites. Clubhouse, large pool with views, social activities and more. 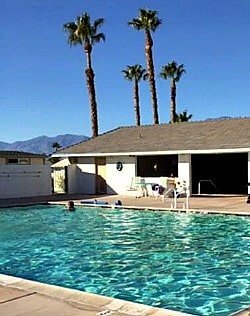 Sahara Park - Mobiles - Currently a rent control property (verify) in good Palm Springs location - Pool, clubhouse, social activities and more - cannot rent out your unit (verify) and no short-term rentals - you must have a required minimum income. Contact them for current requirements. 1955 So. Camino Real - 760-327-1881 - Sales office is on property. 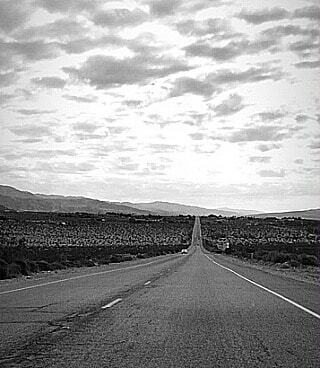 Desert Hot Springs isn't considered an upscale area but that's what many people who live here like about it. It's laid back and enjoys the quietude of the surrounding desert. Not a lot of concrete-paved shopping centers or traffic here. 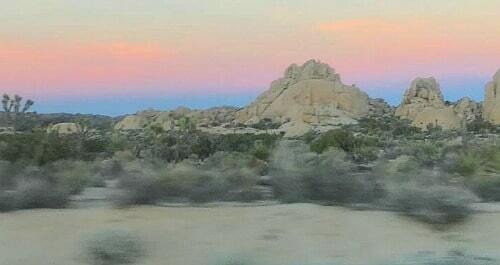 Lots of undeveloped land in the desert with open views to the sky where you can see stars shining at night. If you want great shopping, it is a 20-minute drive to Palm Springs and a little further for Palm Desert and Rancho Mirage, all areas for fabulous shopping and entertainment. 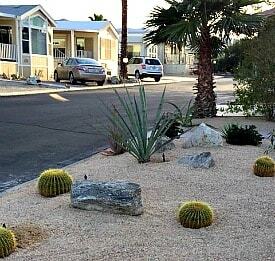 If you like that feeling of being close to nature, you might like Desert Hot Springs manufactured homes communities. 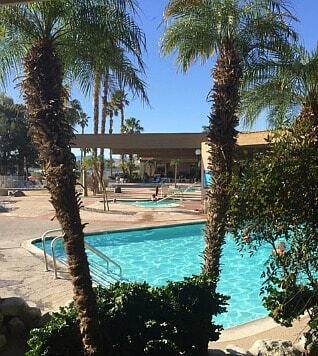 A big plus: Most 55+ communities in this area have the famous hot mineral water in their pools and spas. Lot leases approximately $300's-$500's/mo. 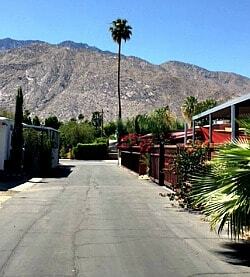 Caliente Springs Resort - Desert Hot Springs - This is a beautiful, well-maintained park with outstanding amenities. The RV park model, manufactured and mobile homes each have a unique personality shown by the pride the owners have in their "tiny homes." You buy or rent a park model or manufactured home and pay a monthly lot lease. There is also an RV park. Snow birding is popular with residents coming from Oregon, Washington, Idaho, the midwest and Canada. 70200 Dillon Rd., Desert Hot Springs - There is a sales office on the property. See the Review on this site. Almar Acres - Small park has RV and RV park rentals on leased land. 9-month leases. Mineral spa and pool and clubhouse. 70205 Dillon Rd. Magic Waters Mobile and RV - 50 sites, clubhouse, pool. and shuffleboard. 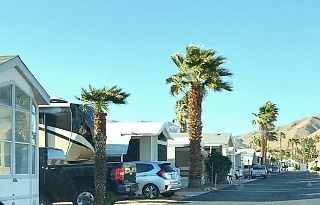 Wagner Mobile Home and RV - one of the first senior parks in the area - mature landscaping helps shelter desert winds - hot mineral water pool and spas and cool spas. Recreation and social activities. 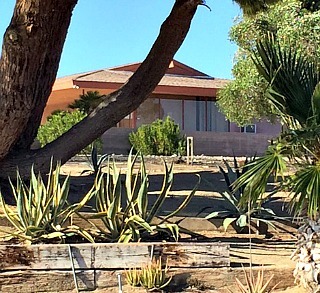 Desert Crest Country Club - Lovely park for RV, RV park models and manufactured homes. Mineral pool, 3 hot springs spas, 9-hole golf, recreation and more. 69402 Country Club Dr., DHS off Dillon Rd. Quail Valley RV Park - Large hot mineral water pool and two covered mineral spas. Some of the lowest fees to members since it is a volunteer maintenance community. Association run by members. Caliente Sands - 55+ community of mobile and large manufactured homes by Sun Communities - clubhouse, pool, rv storage, recreation and more. The Canyon MHP - 34400 Cathedral Canyon Dr.
Desert Sands Manufactured Homes - 299 gated manufactured homes with garages - Large clubhouse, pool, spa, tennis, scenic lakes and more. Near the Eisenhower Medical Center. 32750 Date Palm Dr.
Royal Palms MHP - By Sun Communities - Pool, community center, hot tub, fitness center, recreation, large shuffleboard and more. 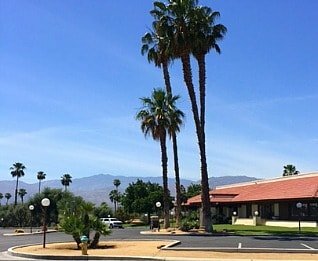 Date Palm Country Club - gated mobile homes with clubhouse, pool, spa, golf, restaurant, fitness center, RV sites, waterfront sites and more. 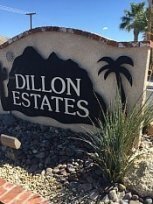 In addition to all the fabulous amenities of this city, they also have the Desert Willow Golf Resort (Two 18-hole Championship Golf courses, Pro Shop, clubhouse and restaurant), open to the public. 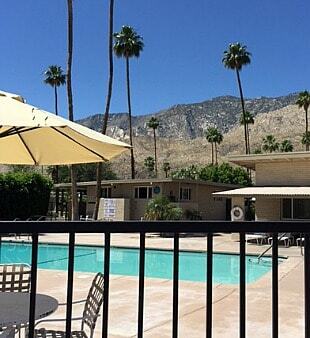 The residents of Palm Desert can receive a discounted rate with proof of residency. 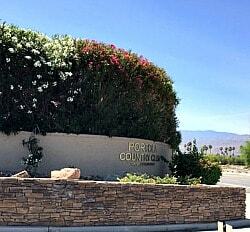 Palm Desert Greens - Large manufactured homes country club community with mountain vistas. 1922 homes. Gated community with 18-hole executive golf, golf shop, and golf pro. Also: on-site restaurant, 3 pools and spa, clubhouse, Fitness Center, recreation, and more. Palm Desert has everything nearby for shopping, restaurants, entertainment and hospitals and medical centers. Palm Desert has the popular shopping centers Town Center Square with Whole Foods Market and Target in Desert Crossing Shopping Center. 73750 Country Club Dr. - Contact local Realtor to view. Portola Country Club - 500 gated medium to large manufactured homes with serene views and groomed grounds around an 18-hole executive golf course. Clubhouse with 3 pools and Jacuzzis, bocce ball, tennis, pickle ball, dog park, social activities and more. From low $100's to $300's. 42500 Portola Ave. - Contact local Realtor to view. Blue Skies Village - Senior community founded by Bing Crosby and named after his song of the same name. The stars who visited have streets named after them. Clubhouse, saltwater pool (verify), gated, and social activities. Rancho Casitas Mobile and Manufactured Park - Gated, land-owned, clubhouse, pool, low home owners dues starting less than $100K. 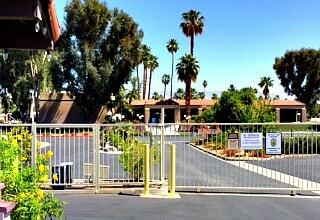 Palmdale Estates (formerly La Quinta Ridge) - Lots of palms in this gated mobile, manufactured and park model homes community with clubhouse, pool, spa, recreation and more. 51550 Monroe St.
Riverdale Estates (formerly Bermuda Palms) - mobile and some rv sites - gated, pool and spa, clubhouse, recreation, RV storage, and more.